Our names are Scott and Mary DeArmond and our sons are Colin (9), William (7) and Benjamin (5)! 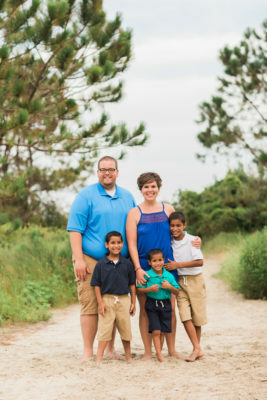 We were originally brought to adoption through our battle with infertility and deep desire to have a family. Looking back, it was all just part of our journey to our children. After we decided to adopt, we considered a lot of different options – international, domestic, and embryo adoption, along with fostering. After a lot of prayer and thought, we met with MLJ and the answer became very clear that we were called to adopt internationally. When we met with MLJ, we discussed in depth the possibility to adopt from Haiti, Burkina Faso, and Bulgaria. 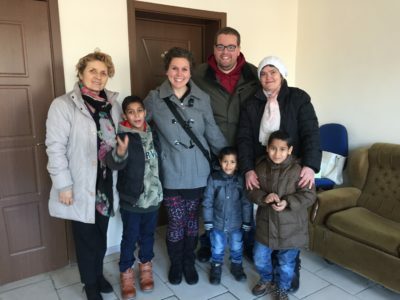 We were drawn to the stability in Bulgaria’s program and felt a connection to the Roma children as we learned about the discrimination they face in Bulgaria. We had never before understood the realities of that and just felt our steps being guided to consider this country that I (Mary), honestly had to look up on a map to see where it was. We walked out of our initial meeting and were both very much at peace and on the same page about not only international adoption, but adoption from Bulgaria. We were impressed with our first meeting with MLJ. We signed up to attend an informational session, but when we were the only ones signed up – they gave us our own private meeting! We weren’t just given pamphlets and told to check out the website, we were encouraged to meet face to face. They took time to answer questions, explain processes, and support and encourage without pushing us to make a life-changing decision quickly. 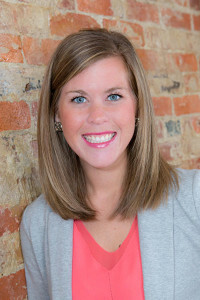 We felt they were approachable and encouraging and would be strong partners for this journey. 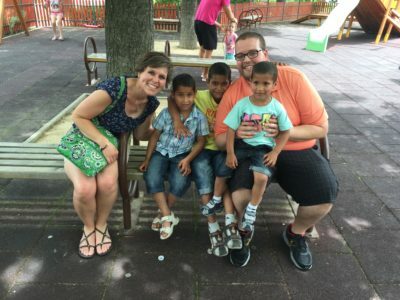 The details were the biggest surprise about the international adoption process! We knew there would be a lot of paperwork, but the details can become overwhelming at times. Staple this, paper clip that, no dates over 6 months… whatever the detail is, it all adds up to additional stress while doing paperwork. Everyone told us that we would encounter at least one unexpected delay in the process. The process can be long in itself, but we were told to just expect that some hiccup would likely happen. Ours was due to a detail! Our approvals through the U.S. and Bulgarian governments were for 2-3 children under the age of 8. When we were referred to our boys, Colin was 8. He was not “under the age of 8” – that detail added about 2 months to our wait between trips as we had to be re-approved by the U.S. government. Our trip to meet the boys was in June and it was, obviously, one of the greatest days of our lives! Vesta, MLJ’s in-country partner agency, was wonderful. Ivo, our translator and Vesta guide, met us at the airport and we immediately knew we were in good hands. Ivo got us settled in our apartment in Sofia, the capital, for a night and the next day we went to the boys’ hometown about three hours away. I remember standing in silence with Ivo and the boys’ social worker in the social services office. It was quiet, we didn’t speak the same language as the social worker, and suddenly through the window of the door we saw the boys. When they opened the door, Colin ran up to us, immediately giving us hugs. William came nearby, but stood and fidgeted with his yo-yo while checking us out, while Ben wasn’t quite ready to leave his foster mom’s side. I remember winking and smiling at Colin – he winked back at me and the rest is history. We spent the week in their home town playing with the boys. We’d meet at about 10 am and go to a nearby park for playing and lunch, meeting back with the foster moms around 3:00 pm. On the final day we were together, we were able to give them photo books of their new home in America, photos of their grandparents, aunts, uncles, and cousins, and quilts my Mom had made for them. It was a tearful “see you later” and off we went – back to America and to the most difficult part of the process. We were blessed in being able to Skype with the boys on a weekly basis in our time between trips. Those 6 grueling months between trips were the most difficult part of the process for us. We had met our sons and were completely in love, only to have to see them through a computer screen for 6 months. Thankfully we had several showers and preparations to make for their arrival, so we did our best to keep busy. We got off the plane in Bulgaria for our second trip, anxious to pick up our boys and begin our life as a family of 5, and were immediately told that William had the chicken pox. Thankfully, it was a mild case! Colin and Benjamin ended up having chicken pox over the next couple of weeks as well, but since then they have all been very healthy. They’ve received great blood work and physicals from both their regular pediatrician and the International Specialist and are thriving! They’re enjoying school (preschool, 1st, and 3rd grade) and picking the language up faster than we ever imagined. They’ve participated in a handful of sports camps, taken swim lessons, and Colin and William are getting ready to start Flag Football for the fall season. The most difficult part of the transition for us, but also the biggest blessing, is that they were in wonderful foster environments in Bulgaria. They miss their foster families terribly, but also are enjoying their new home… the difficulty in processing all of the emotions they’re experiencing is overwhelming and hard to know how to best help them through their grief. At the same time, we are SO grateful for the wonderful care and love they received in Bulgaria. It’s an ongoing process and as our relationship and trust continues to grow, their grief evolves, too. They are learning how to be in a forever family, just like we are learning how to be parents. One thing we feel is unique about our story is our relationship with the boys’ foster moms. In international adoption, many children are in orphanages and, though foster homes are becoming more common in Bulgaria, there are always concerns about your child’s environment. 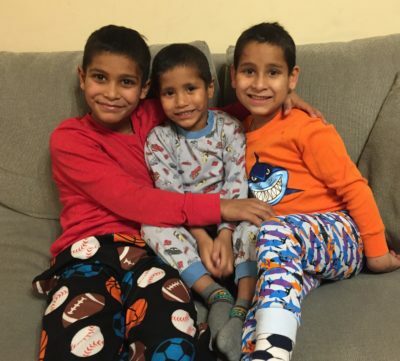 Our three boys were in two different foster homes and we were blessed in that both were wonderfully nurturing and loving environments. We have built relationships with their foster families that continue to this day – we communicate regularly with the foster moms and their families. The boys enjoy communicating with them during our Skype conversations and emotionally do well with seeing and hearing about them often. We send pictures and messages multiple times a week and I (Mary) communicate with the families to stay up to date on their lives and what is happening in Bulgaria. We are confident we will always have a relationship with these families and they will forever be a crucial part of ours. We are thankful that they loved our children so well and provided safe homes for them in the time between their biological home and their forever home. They are not only our children’s foster families, but they are part of our family and a relationship we work hard to continue to grow. We have the best support system. Our family and friends have been along with us on this journey the entire time. From the moment we announced our adoption, they’ve eagerly awaited every appointment, signature, skype session, and meeting in the process. The boys’ homecoming was something we will never forget as we walked around the corner in the airport to see a huge sign and even bigger group of people waiting to give the boys hugs and welcome them to our family. The boys knew their grandparents, aunts, uncles, and cousins from the photo book we had given them and immediately ran to them in the airport. Their relationships have continued to grow over the past 8 months and we are so thankful to have such supportive family and friends to help raise our children. We’ve seen an incredible outpouring of love throughout our process and since the boys have been home. We’ve received so much support and are incredibly grateful for the encouragement we have continuously received from our family and friends. We’ve also been supported a lot by fellow adoptive parents. Parenting children from hard places uses some different perspectives than traditional parenting techniques, so being able to vent, listen, or bounce ideas off of friends and fellow adoptive parents has been critical for us. They’ve been the best resource for us. Through personal conversations, specific Facebook groups, and connecting with MLJ families, we’ve received such strong advice and wisdom. We’ve spoken with MLJ’s social workers and have been encouraged to reach out at any time. We are so thankful that the post-placement reports are part of the process as the one we’ve had so far gave us an opportunity to reflect and have a scheduled time to ask questions. God does not call the equipped, He equips the called. There are so many reasons that it can feel like it “won’t work.” Some of our thoughts were that we couldn’t afford it, we couldn’t risk the unknown histories often associated with children from hard places, we couldn’t go from no kids to three kids in a matter of minutes… but we can, and we did, and it’s been the greatest blessing. You can afford it, you can manage the unknown histories/medical diagnosis, and you can go from 0 to 3 kids in a matter of what-feels-like-minutes. Parenting has its challenges, parenting kids from hard places has its challenges – there is no doubt about that. But parenting is the greatest joy I’ve ever known. These boys have taught us more about love, grace and forgiveness than we could ever put into words. The opportunity to be their Mom and Dad is a gift beyond comprehension. 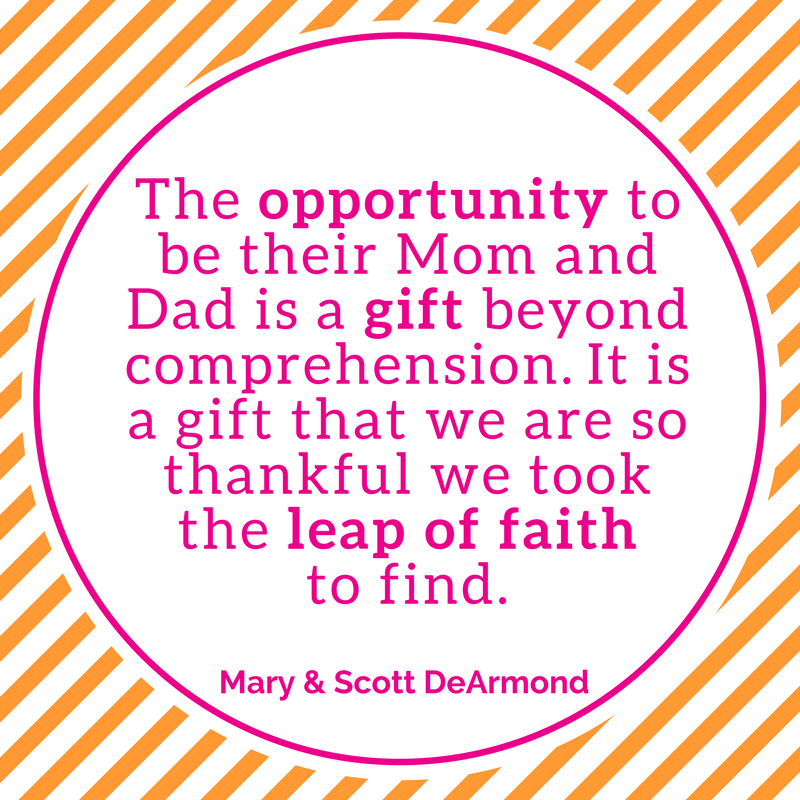 It is a gift that we are so thankful we took the leap of faith to find. To learn more about adopting from Bulgaria, contact us.